Transfer data at blazing 800Mbps speeds - twice the speed of the original 1394! 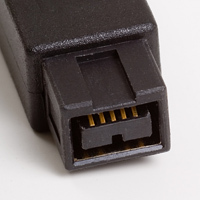 Connectors: 9-pin Male to 9-pin Male. Data Transfer Rate: 800 Mbps. Pure Beta Mode: Connects Firewire 800 devices to Firewire 800 ports. Supports Plug-and-Play operation. Hot Pluggable. Molded strain relief ensures years of trouble-free data transmissions. Application: Video presentation and editing, desktop and commercial publishing, document imaging, home multimedia, personal computing. Designed For: Digital camcorders, scanners, printers, storage devices and other Firewire devices. Compatibility: PC, Mac, Sun and other IEEE-1394b equipped computers.